Sometimes it's the little things that make a difference. It could be the unexpected. Or maybe just a tiny adjustment or addition. It could even be something most would deem insignificant, until you consider it. How did it come about? Someone must have given thought to a process for the intent of improvement, regardless how big or small. 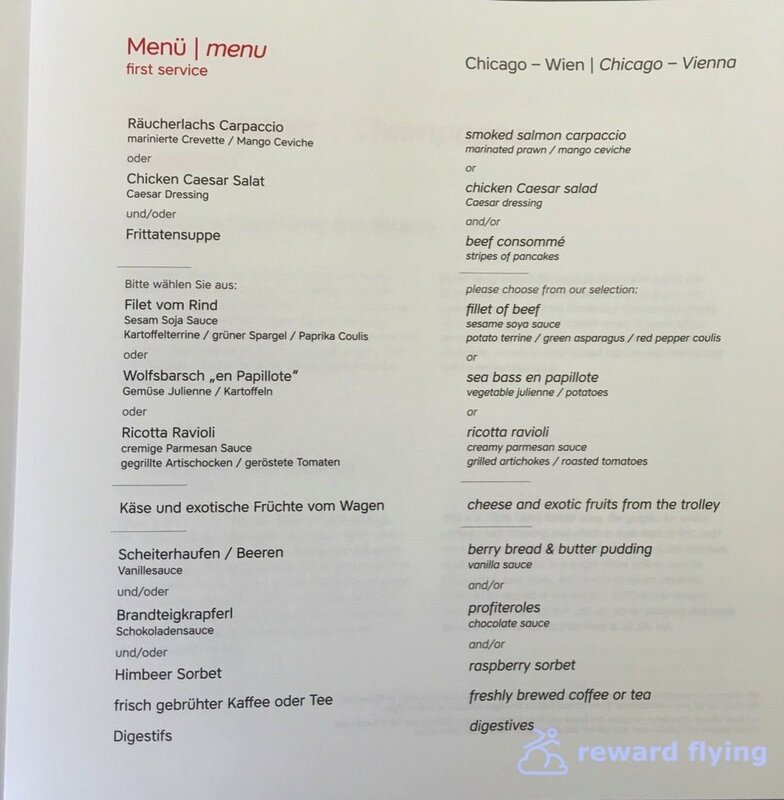 Today's flight from Chicago to Vienna on Austrian Airlines had something that might seem insignificant, but made me appreciate how hard this airline is working to make flying a better experience. A clothespin. A tiny clothespin. 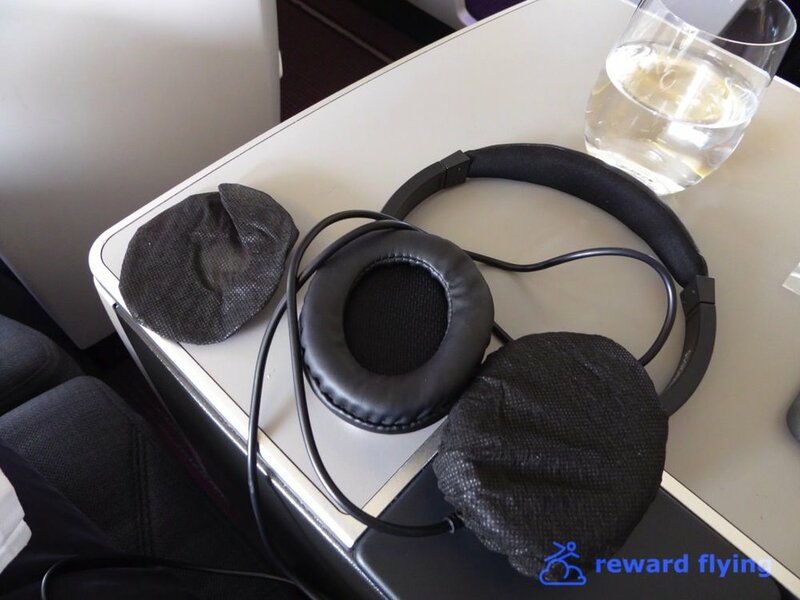 How often has a sudden bump turned into a stain on your shirt when trying to consume food or beverage at 36,000 feet? Sure airlines have napkins with button holes, but what if you don’t have a button? With Austrian simply use the tiny clothespin to secure the napkin to your shirt or blouse. Simple. Brilliant. My second flight on Austrian reaffirmed the fondness I've acquired for this airline. Are they perfect? No. But the detail and effort make up for any deficiencies. And those deficiencies, in my opinion are minor, simply relating to a sparse amenity kit and some nitpicking on the seating legroom. I'll trade those issues for a comfortable seat and two outstanding meals on an 8 hour flight any day. It turns out one would expect to have the meal I enjoyed at a restaurant where you need to make a reservation. Having experienced hundreds of airline meals in all classes over my million plus mile flying history, two meals now stand out. A breakfast on EVA Air and this dinner on Austrian. 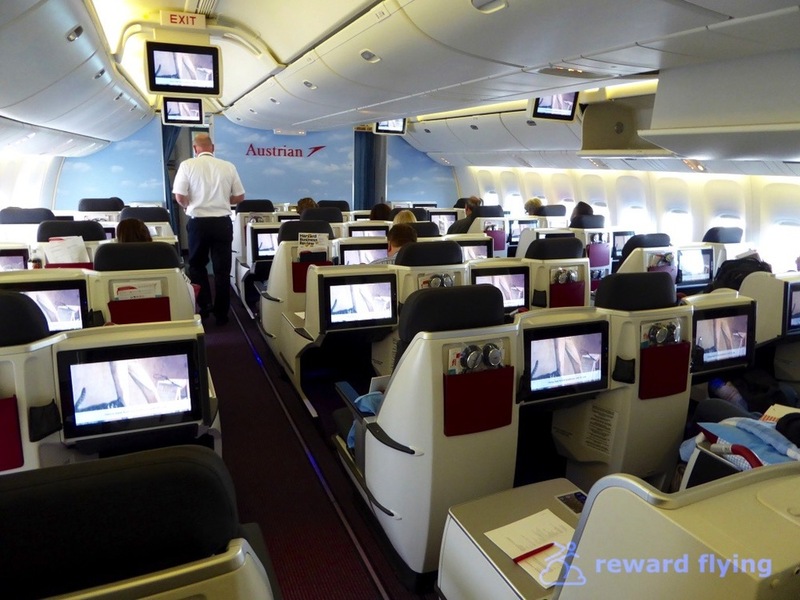 Having flown Austrian’s 767 from VIE-ORD in March I wanted to try their 777 cabin at some point. With an existing reservation on United to Europe, I found an Austrian flight from ORD to VIE on the same day. It was an easy switch, even though my UA flight was in Global First I had no regrets. A one-way fare on Austrian from ORD to VIE is $6,051, while a round trip is $8,500 in business class. You can do LOT one way for about $2,800 and Austrian does have fare sales. United charges 70,000 miles so using the one way fare, the redemption value is 8.6 cents. A round trip would be 6 cents. All great redemption values. Ticketing done on United’s website, easy and without issue. Austrian uses the Swiss lounge at ORD terminal 5. 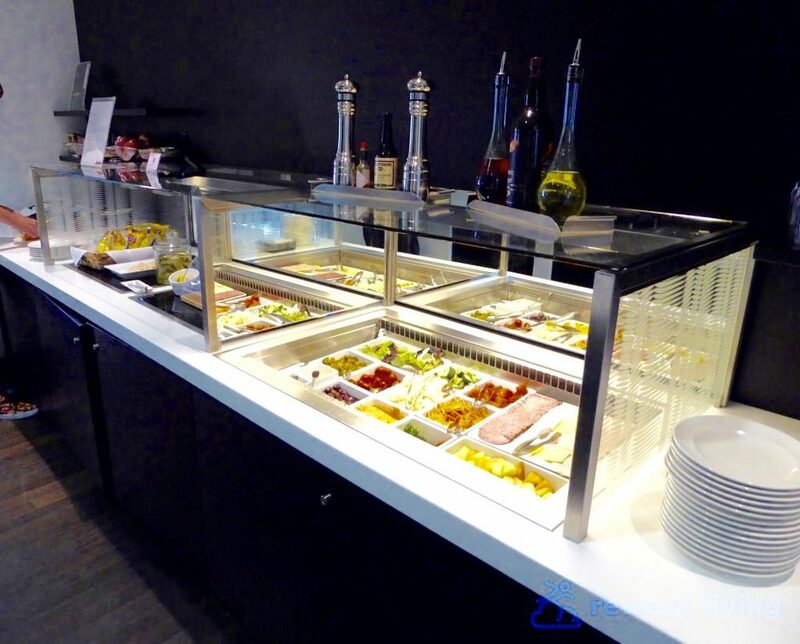 The facility is extremely small with a limited food and beverage selections. No reason to go early for this one. Being a 777 the cabin is obviously roomier than on the 767. With higher ceilings it was less claustrophobic for sure. The major difference in cabin layout are the window seats. 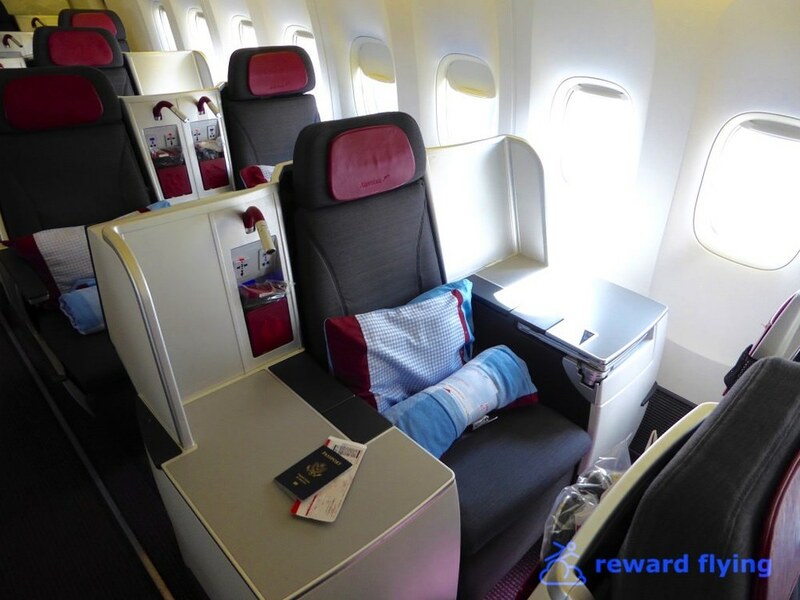 On the 767 it is a single seat where the side table alternates against the aisle or against the window. The 777 makes use of the throne seating and has dual seats against the window in some rows. Throne seating is where one row has two seats against the window separated by a side table then the row behind having one seat and a side table on either side. So the number of seats in a row alternates, 2x1x2 etc. The throne with 2 side tables makes for a very spacious area to work. The seats themselves throughout the cabin are the same. The center section there are two seats separated by a side table and offset to the row in front as well as being staggered for privacy. While Seatguru has 1A marked yellow for caution, it doesn’t appear much traffic or galley noise affects this area. Most aisle traffic is on the right side where the front and mid galleys connect. 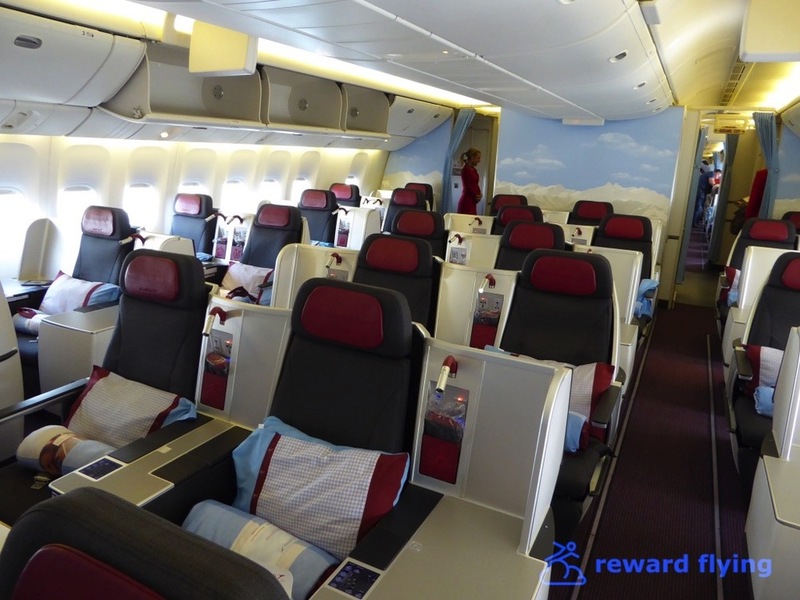 In the back of the front cabin, while 7 A/K are secluded they are really close to the galleys and even the flight attendant commented to me that these seats should be avoided if possible..
Of course the 777 has larger overhead bins. 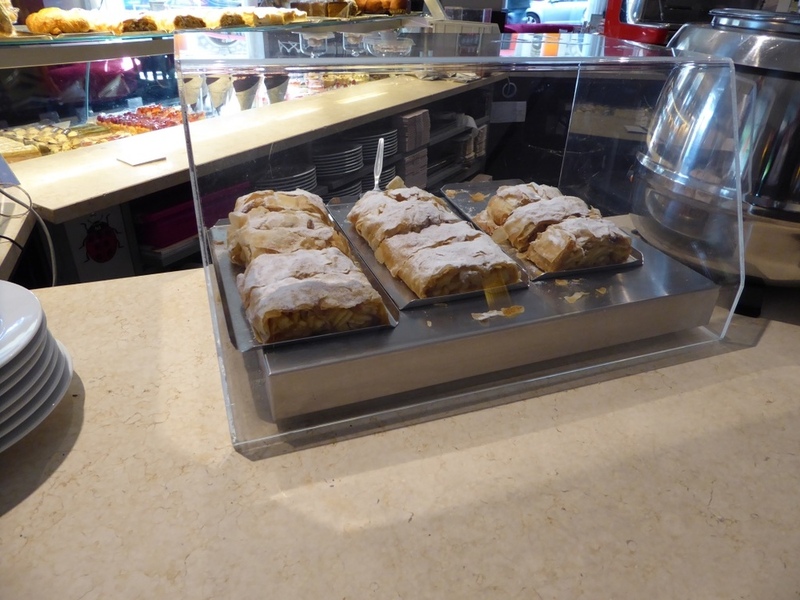 Even so, Austrian enforces their limited carry-on weight rule. You are allowed two pieces, each piece not weighing more than 8kg or about 17.5 pounds. To be clear, not one proper sized carry-on weighing say 9kg. It would have to be one piece at 8K and another holding the remaining 1 kg of stuff. Said another way, two pieces each with 8kg totaling 16kg are allowed, not one totaling 9kg. My bag came in slightly over 8kg and I had to remove a jacket from the bag before being allowed to carry the bag on the plane. The Vantage seat is a good, not great seat in my opinion. Narrow but comfortable. However the seat control is on the upper corner of the armrest/side table (as shown below with the red square). Resting your arm can easily press one of the seat control buttons. Seems this could have been thought out a little better. Amenity Kit pouch, electrical outlet, USB charger and audio jack. 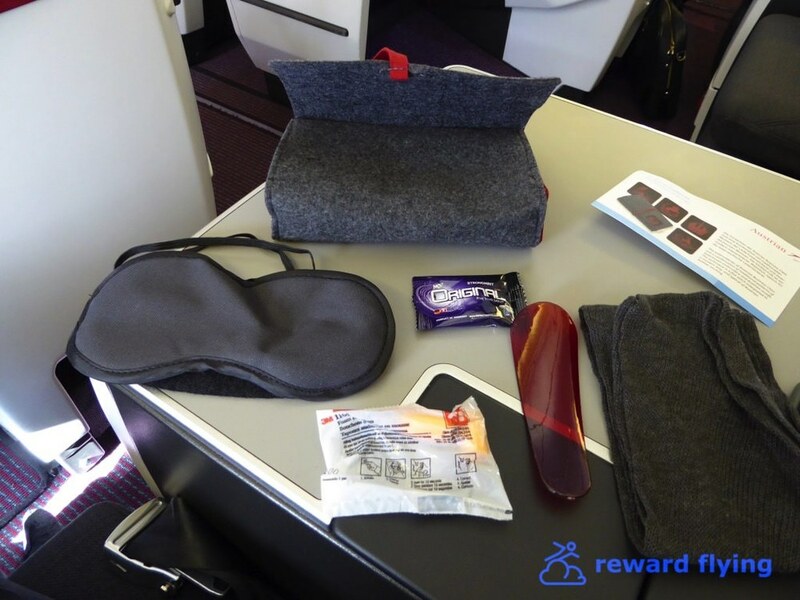 Take the amenity kit out and use the pouch for your phone. Storage areas on either side of footwell at floor level. For shoes? 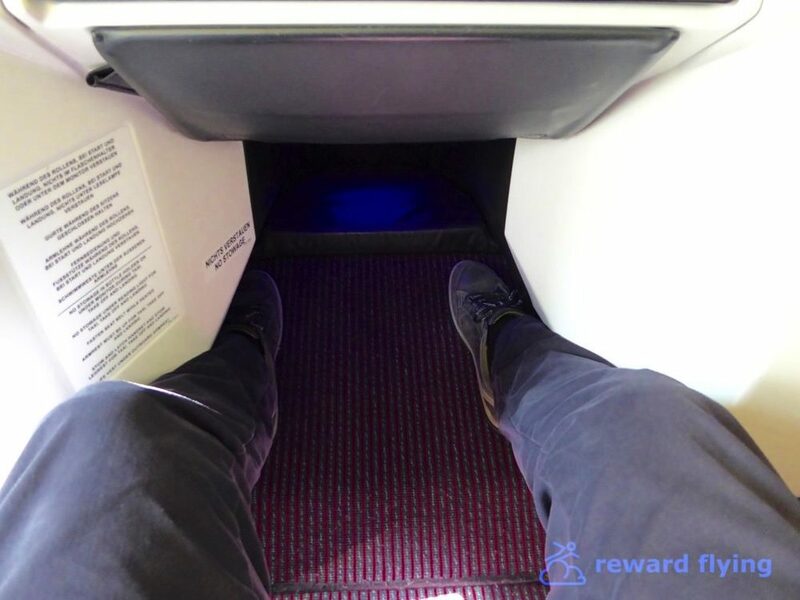 As mentioned in the 767 report, the footwell is somewhat narrow. The 777 seat has the same width for the footwell, but underneath at the back it opens allowing for your foot to rotate more than the 767. While a great improvement, the opening is still rather small. A pillow and duvet are provided. Using duty free shopping you can purchase a new duvet for $50 euros if you like it. 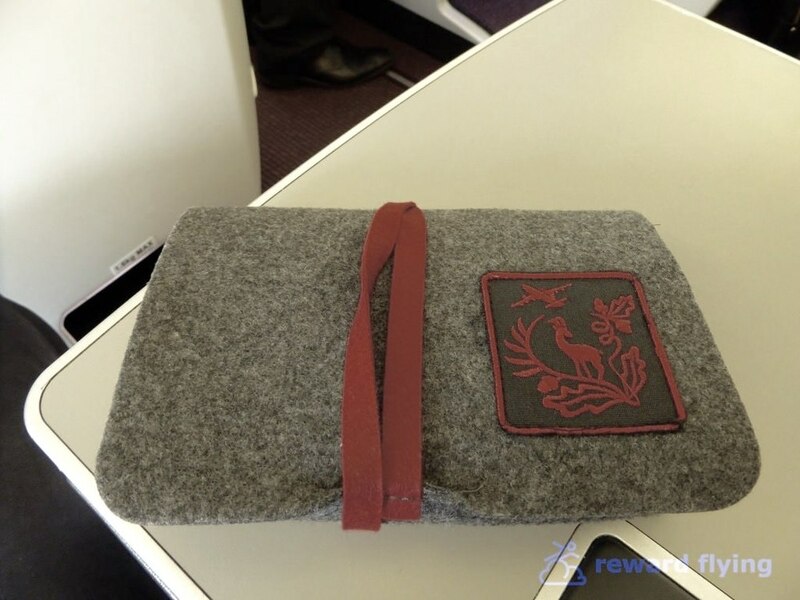 A standard fare amenity kit is provided. Also the supplied headphones have a disposable ear cover which is a nice sanitary feature. 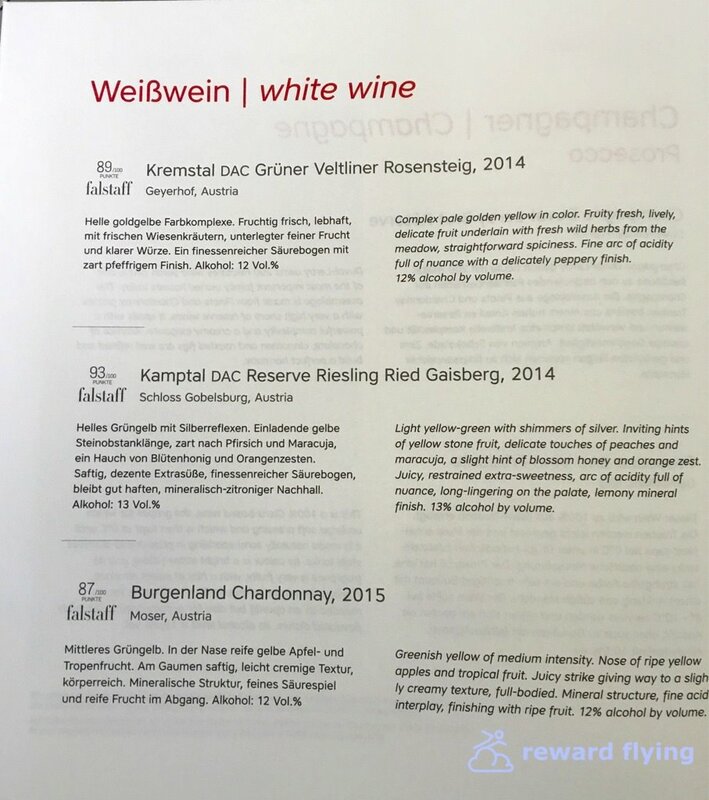 Austrian features local wines adding to the native Austrian culture they strive to replicate. 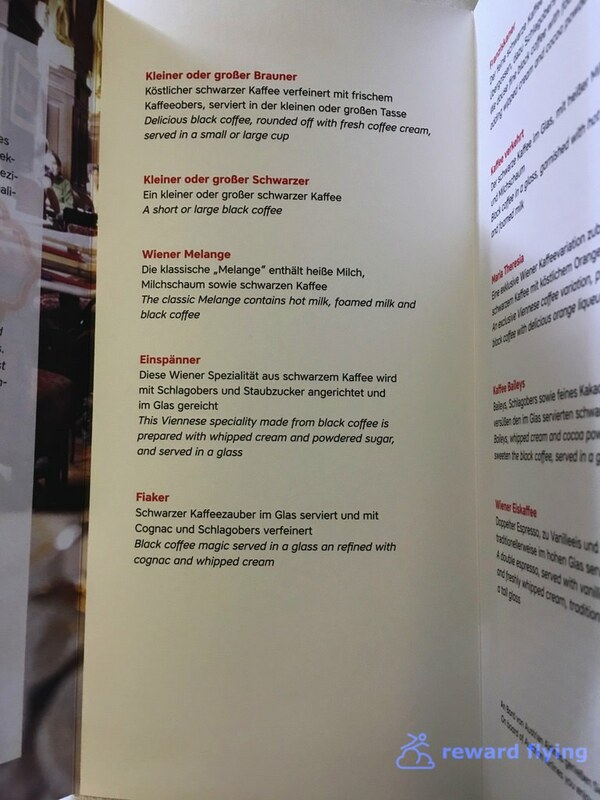 The dinner selections were included in the bound menu while the breakfast menu was passed out on a separate page with your selections required before departure. Care was taken with place settings. Notice the different linens, a more formal white for dinner and livelier red checkered cloth for breakfast. After being offered a drink and served some warm nuts the meal began with trolley service. The trolley is a cart covered in white linen making it look like a restaurant serving cart. It's not a standard airline cart wheeled down the aisle as you will see on the SAS review. I choose the filet of beef for dinner knowing full well how beef typically turns out on a plane. Don't tell Austrian you can't make a tender, perfectly cooked filet of beef on a plane. This was a meal you would have gladly paid $30-$40 for in a fancy restaurant. The potato terrine was perfectly cooked and the red pepper coulis was delicious as well as the sesame soya sauce complimenting the meat perfectly without overpowering flavor. Add in tender crisp asparagus and you wonder, how did they do that? Next up dessert. Again using a trolley you had choices of fruits, cheeses, sorbet, bread pudding and portfolios. The hardest part of the flight for me was to tell the flight attendant to only give me a small portion. 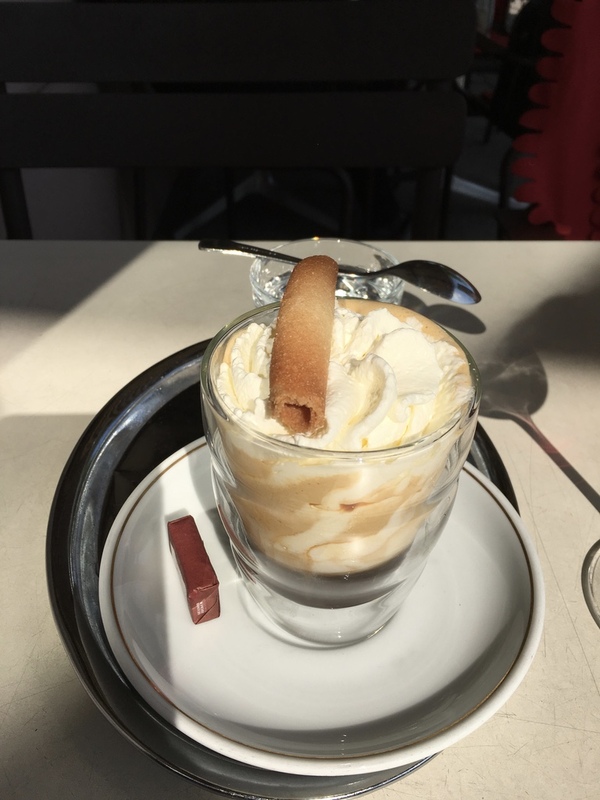 Now for the Vienna Coffeehouse. A creature of habit I choose the Franziskaner again. Why mess with success? 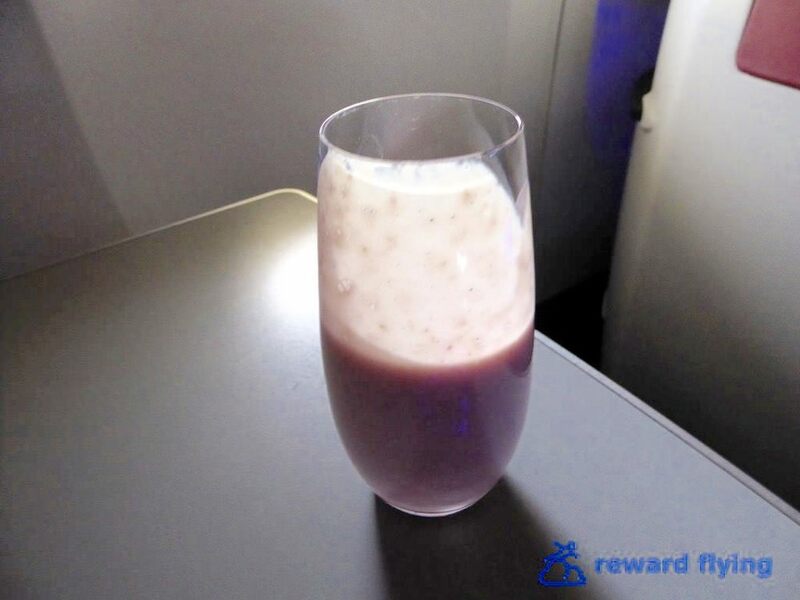 Exactly 90 minutes prior to landing breakfast service started with a choice of smoothies. I chose the berry. Your choices for breakfast were then served as well as a selection of breads. The eggs were freshly cooked. I simply can't image having two better meals on an airplane. This is the same system as on the 767. While the monitor itself is brilliant and the system is easy to control, the selection of entertainment this time around was not very diverse. Having flown 2 months prior some of the selections remained, such as the PilotEye video. Movie selection was fair. When a 52 year old movie, as outstanding as it is (Bond’s Goldfinger), is the best you can find either your movie interests are poor or the selections are weak. In my case it may be the former so I’ll reserve judgement. WiFi: Austrian does not have WiFi which may be an issue for some. I was not as impressed with this crew. It’s not that they were deficient in their duties in anyway, or not friendly or aloof. It just seemed the service was rushed. Dinner was served in rapid fire succession. While this serving style may have been planned due to it being an overnight flight, departure was at 4:30PM so dinner at a little after 5 was early. The aircraft was a 777-200ER, tail number OE-LPC, the Dream of Freedom aircraft. It is a 14 year old plane originally delivered to Lauda Air. You couldn’t tell it’s age from the looks of the interior as it was immaculate. Austrian is 2 for 2 in my experiences. Going to Europe or beyond? If you can land an Austrian flight you will be very happy. Travel tidbits in Vienna: The City Airport Train is located in the Vienna Airport. For 19 Euros it can take you round trip to City Center and back, about 15 minutes each way. When you exit the arrival hall turn right where all the people are standing and walk down the ramp to the train. It could not be more convenient. You can even buy the ticket on the airplane. If not, there are plenty of places to purchase the ticket. The NH Hotel Wein is located across the street from the airport. It's convenient and reasonably priced (around $150 a night). If you have an early morning flight it can't be beat. If you take the City Airport Train to City Center there is a Hilton across the street. Public transportation is available from here to anywhere in Vienna or if the weather is nice it's about a 15 minute walk into the center of town. When you return you can check your luggage and/or get a boarding pass in City Center for your Star Alliance flight. And if you want some authentic Austrian Wiener Schnitzel, try Cafe Museum. To all who complain about US domestic business/first class, I say, GO TRY EUROPE. My second flight on Austrian reaffirmed the fondness I've acquired for this airline. Are they perfect? 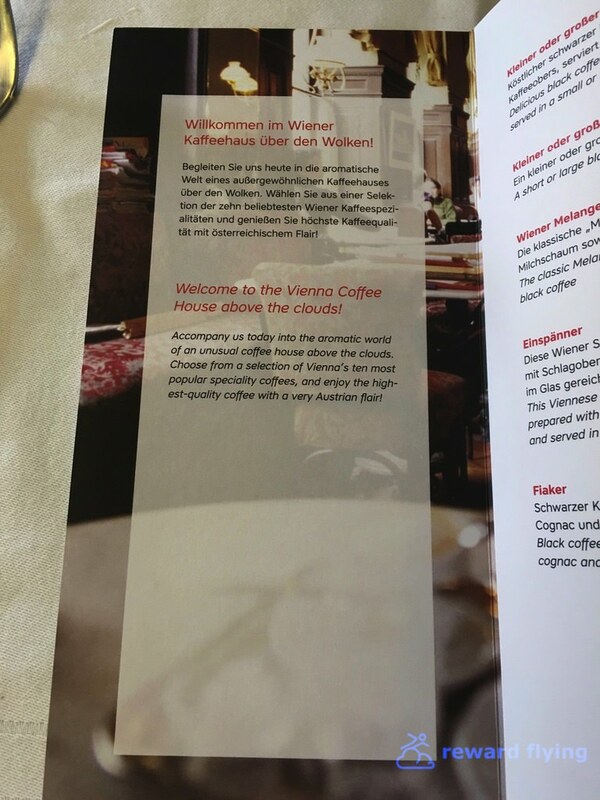 From my perspective, Austrian gets top grades in comfort, food service and entertainment. And that's the trifecta when spending 8 plus hours on a plane. Do you have any Austrian experiences you'd like to share? Feel free to leave a comment.